Note: While this review will be spoiler free, it will reference the previous book in the series. 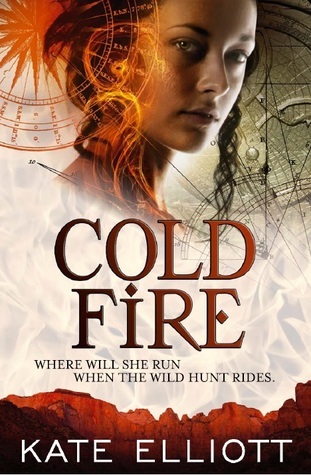 If you haven’t started yet, check out VBC’s review of book 1 Cold Magic. Cold Fire picks up exactly where Cold Magic left off. Kate Elliott even backtracks through the last chapter of Cold Magic as a recap adding a few more details to break up any monotony. Cat and Bee are trying to escape the Mage House and turn to the trolls at Godwick & Clutch Cat had previously met. What they couldn’t anticipate is the arrival of General Camjiata, the radical who wants to usurp the current ruling Prince of Europa and wants to use Bee and Cat to do so. Upon deciding to leave the General’s company the girls become embroiled in a quest that leads to us discovering Cat’s sire as well as saving Bee from becoming a casualty of the Wild Hunt. I’ll admit, the political goings on in this series thus far have been a whirlwind. While they have an influence on the world in which the series takes place, and while Cat may navigate the inner workings of impending revolution from time to time, I’ve never found it is by her choice unless someone she cares about is entangled within as well. I found that Cold Fire focused more on the decision of Cat’s emotions. After a trip through the spirit realm, she comes out the other end on the islands of the Antilles in the Caribbean with a far warmer climate. Since time moves differently in the spirit realm, she ended up being gone for seven months. And because anything can happen in Kate Elliott’s novels, Vai, Cat’s estranged husband, happens to be on the island when she comes ashore. How can you not want to explore more of their dynamic after that startling out-of-nowhere statement? Elliott must have thought the same because Cold Fire certainly explores Vai much, much more. His motives for being in the Caribbean are unknown; although he claims to everyone he came looking for his missing wife, Cat knows there’s more to his story. Regardless of this, with almost everyone else around her being of unknown association, Cat finally has to make a decision of what she feels for Vai and if those feelings lead to trust as well. I was really happy that Elliott didn’t prolong the inevitable when it came to their relationship. We finally got to see a different side of Vai. Still being vain and arrogant, we begin to see that he is more than his Mage House affiliation. This was something we saw very briefly in Cold Magic when they visited his village, but it becomes something more when he’s conversing with people who are not kin. As in Cold Magic, the down times are few and far between for Cat. And what middle book wouldn’t be complete with a little cliffhanger ending to lead us into the third? I’m just glad all books in the series are out.